Yesterday, I went out for my first trail run of the season. 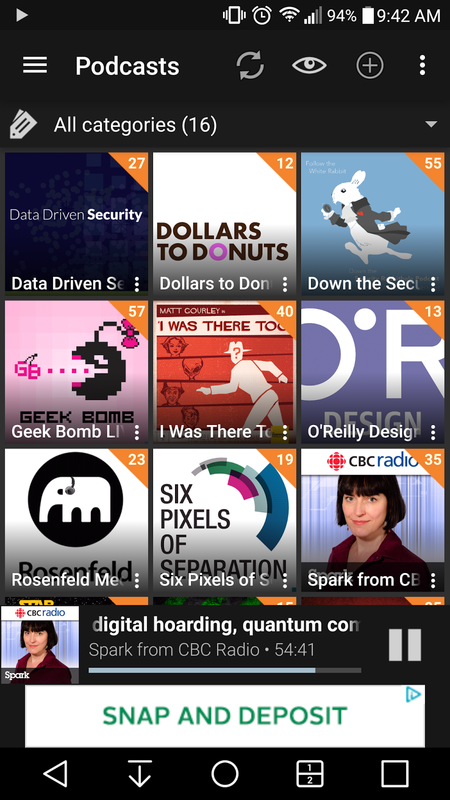 As I ran, I listened to a CBC Spark podcast which, as usual, was full of random and interesting stories about how tech impacts culture and our everyday lives. There were a few items that I really wanted to bookmark, timestamp, or Evernote for later research, but short of stopping, pulling my arm band off and making an actual note, there is absolutely no way for me to identify or capture interesting tidbits while I'm active. "Ok, Google: timestamp Podcast Addict now"
And then I wanted Podcast Addict to flag the current section of the podcast I was listening to, so I could jump to it afterwards and capture the info or URL being discussed at that moment, rather than have to take the time to scrobble through an hour-long podcast to find that particular moment again (which, let's face it, I'll never do). Why don't more apps have integrated voice commands for basic functions? Why don't more apps have functions I actually need? And then voice-enable them? How hard would it be for app devs to integrate with Google Now to enable control via voice, rather than build it themselves? And of course, you can pretty much open any app on your Android phone with Google Now, but once you get in, that's where things generally stop. Once you're actually inside an app, you can't do anything at all with voice commands. For me, it's annoying. For those with accessibility issues, I can't even imagine what it means for their everyday lives. Considering Google Now's functionality is a little bit like If This Then That, it listens for commands and can trigger certain behaviours in the apps if they are predefined. That is, they have to be accounted for and defined in the first place. I wish that app devs would consider less how they want us to use their apps and spend more time watching their users in the wild to see what we actually do with them — or want to do with them — to expand on the features we want and not those we don't need (I'm looking at you Twitter Moments).